Typical patients may have broken a bone in a fall or undergone joint replacement surgery and recovered enough to leave intensive care. Transitional Care provides a bridge between hospital and home that is dedicated to speeding the recovery and returning the patient to home as quickly as possible. 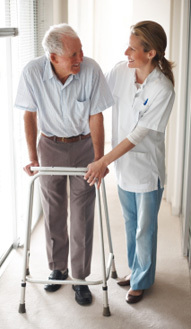 The unit specializes in aggressive, short term rehabilitation for its patients. Our individually designed therapy team is dedicated to getting patients back to the daily activities and routines that they enjoy. High quality rehabilitation includes family education, home evaluations and daily activities such as dressing, meal preparation and car transfers. Patients regain strength following hospitalization for a stroke, heart attack, orthopedic surgery, fractures, respiratory illness, and other severe illnesses. Such rehabilitation offers treatment with the most advanced rehabilitation technology such as the Bionic Leg®, upper and lower extremity Bioness® units. Transitional Care takes an interdisciplinary approach for each patient incorporating physical therapists, nurses, a social worker, a dietitian, and a pharmacist. This unit exemplifies the ideals of patient centered care through collaborative efforts. The patient is at the center and therapy meets all necessary needs for the patient which includes meeting the patient’s dignity and privacy issues as well as having the patient be involved in the decisions regarding their care.